Today I am continuing the story of our 2005 travels. We awoke at the Shady Grove Campground in Seibert, CO on Sunday, July 24th and we drove west on I-70 past Limon, then jogged west and north, mostly on farm roads to get to Greeley, CO. We headed north before we got to Denver and the mountainous part of Colorado. The eastern side of Colorado is relatively flat and the west part of the state is dominated by the Rocky Mountains. I did not want to go into Denver so we could avoid the traffic. Still, we were moving up in elevation, which made it cooler, but we were avoiding the higher mountains that would slow us down. The trip was only about 160 miles, but we saw lots of farms growing mostly cabbage, corn and onions. There were other crops, but we did not recognize what was growing. We saw one fruit orchard, but did not know the trees. We always wonder why people do not put up signs to tell what they grow. I am sure the farmers would think we were ignorant for not knowing. We stopped at the Greeley RV Park and it was okay, but nothing special. The daily rate was $24, which is more than we normally pay, but we decided to stay a few days anyway. We even found a spot with a shade tree that did not obstruct our internet or TV satellite dishes. A little shade part of the day made a lot of difference in the daytime temperature inside our motorhome. It was cool enough that we could leave our shades up and enjoy views of the outside world. Our youngest son Christopher called in the afternoon. He said he was okay, but he sounded tired. Kathi reminded him that he only had two and a half months left on this deployment. In retrospect, I think that sounded short to us and long to him. We awoke Monday morning and it was cool enough to turn off our air conditioner and open the windows. We love the wind blowing through and airing out the motorhome – it stays closed up for most of the year. In the afternoon we went to see “Batman Begins.” We both enjoyed the movie. We stopped by Walmart on the way home to stock up on food, realizing that our next few stops were in small Wyoming towns with no big grocery stores around. The next day we went to Olive Garden for lunch. Kathi had chicken spiedini and I had pizza with pepperoni and Italian sausage. The chicken spiedini was not on the lunch menu, but Kathi remembered the dish and asked the waiter about it and the cook agreed to make it for her. After lunch we went home and began preparation for our trip into the desolation of Wyoming. We were RV travelers and always eager to be on the road again. I have no pictures from Greeley, but below are some flower pictures from around the country. 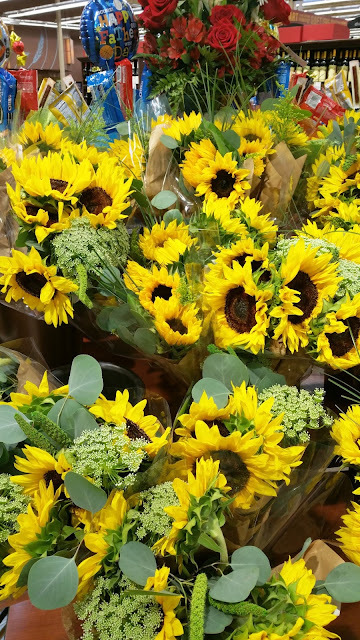 Sunflowers in Kroger grocery store in League City, Texas. 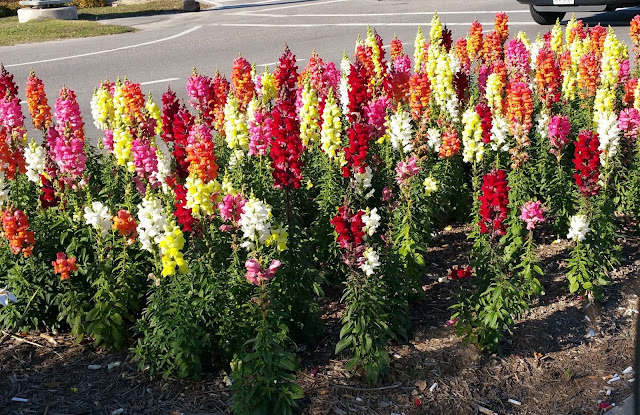 Snapdragons on League City Parkway. 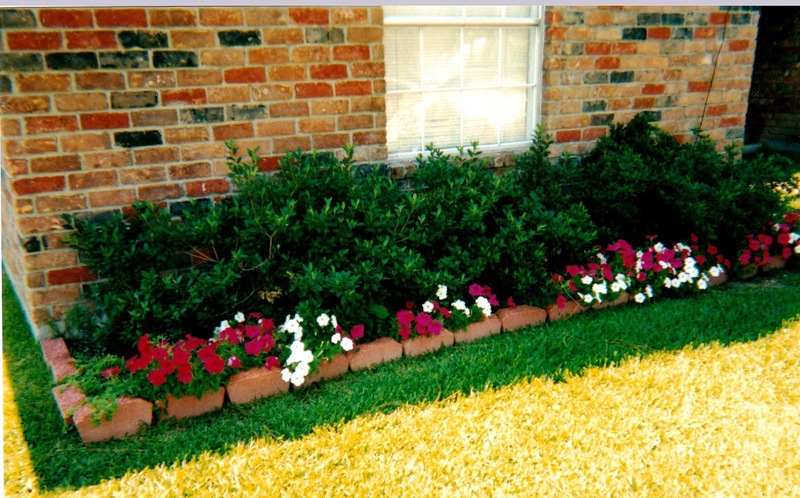 Kathi's flowers on Polk Lane in Deer Park, Texas. 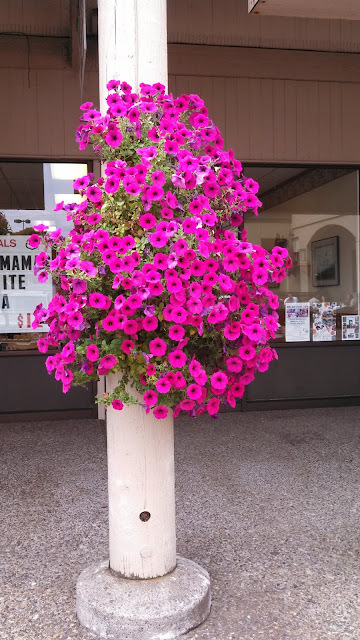 A hanging basket of flowers in Raymond, Washington. Crimson red flowers on the Stanford campus. Please use the Facebook share button, if you have friends that would enjoy the blog. Thanks.